e the checkered flag from their fully faired BMW sidecar combination. The upshot: it was the first the World Sidecar Championship title for Germany and the first for BMW. For the two riders from Kirchhain near Marburg, it was the third win of the season. Car mechanic Noll and telephone engineer Cron had previously claimed two impressive World Championship rounds when they won the German Grand Prix and the Swiss Grand Prix. Their season of success was complemented by two second places – in the Ulster GP at Belfast and the Belgian GP at Spa-Francorchamps – and a third-placed finish in the Isle of Man TT. 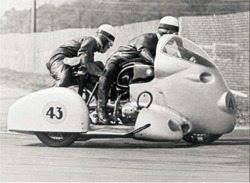 It meant the BMW sidecar team not only took to the podium in all six World Championship races of that year, but Noll / Cron also managed to break the longstanding dominance of Norton in this discipline. The reward? They took the World Championship title home to Germany for the first time. “If you drop out, you’re out of time”. At the outset of the season, however, that was certainly not on the cards. Englishman Eric Oliver, four-times World Champion and defending title-holder, managed to claim the first three races on his faired works Norton with sidecar man Les Nutt. But in the Feldbergrennen, which did not count towards the World Championship, Oliver had a serious accident. As a result of which he was unable to compete in the German GP on the Solitude track outside Stuttgart. That gave Noll and Cron their chance. With their fuel-injected RS, they claimed BMW’s first ever victory in a World Championship race. In the Swiss Grand Prix, the fifth round of the season, Noll and Cron were the first to cross the finishing line again. Their rival Oliver managed to gain just two points, and ahead of the final race at Monza both riders had drawn level first with 26 points each. But Oliver couldn’t race at Monza either, and his arm had to be put back in plaster. It meant all Noll / Cron had to do was score. But the duo, lining up at Monza for the first time with a similarly fully-faired sidecar combination, would not have been content with that. From the off they tackled the race in commanding style, carving out a lead of more than four seconds a lap over the Norton duo of Smith and Stan Dibben (wBW book review of Stan Dibben’s “Hold On”). The press was disappointed that the big showdown did not materialize, but with their superior ride Noll and Cron proved that they were worthy World Champions. After the Football World Championship, there were World Champions to be celebrated again – this time in motorcycle racing. “Our title win hit the national headlines,” Noll recalls. 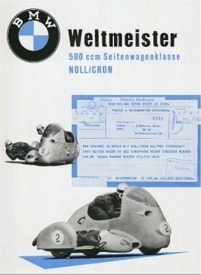 Even Oliver would arguably have had little chance against the new full fairing, the unique hydraulic drum brakes and BMW’s supreme team strategy in which “it is the brand that wins first, and only then the rider”. The first World Championship title of 1954 marked the start of a unique run of successes in motorcycle racing. By 1974, BMW sidecar combinations had claimed 19 Drivers’ and 20 Constructors’ World Championship titles. Noll and Cron managed to repeat their title win in 1956 after having to settle as runners-up in 1955. After this final World Championship event, the twosome retired from their racing career in autumn of 1956.